Equity Crowdfunding promises to bolster new business formation in the United States by making more capital available for startups, a sector that has been starved by the traditional investment and lending institutions. The 2nd Annual Crowdfunding Conference and Bootcamp will be presenting Rep. Patrick McHenry with the 2013 Crowdfunding Visionary AwardTM for his work on the JOBS Act. McHenry had the vision to recognize that capital-seeking entrepreneurs were facing a failing system, and the wisdom to provide a solution to the problem. The 2nd Annual Crowdfunding Conference and Bootcamp is pleased to announce that this year’s Crowdfunding Visionary Award TM will be presented to Congressman Patrick McHenry (R -NC). McHenry originally sponsored the equity startup exemption provisions of the JOBS Act and navigated it through a polarized House to an almost unanimous passage. After being amended and passed by the Senate, President Obama signed in on April 5, 2012. "Countless young, ambitious entrepreneurs are out of luck as they look for capital to expand and compete on the open market," writes McHenry in his chapter for the #FixYoungAmerica book. Crowdfunding, says McHenry, is the solution to those problems. It would allow entrepreneurs to raise money from many different investors, each pitching in a small amount compared to angel investors and their giant checks. Crowdfunding has already matured into nearly a 3-billion dollar industry, and with the implementation of the Jobs Act, it is forecasted to grow exponentially as more and more entrepreneurs, investors and members of the financial community propagate the marketplace. Last year’s honorees were the entrepreneurial citizen-lobbyists Sherwood (Woody) Neiss, Jason Best and Zak Cassady-Dorion, who helped to write and talk the Startup Exemption of the Jobs Act through congress. The 2nd Annual Crowdfunding Conference and Bootcamp, October 13-16, is the largest gathering of its kind, bringing together the leaders, professionals and companies who are actively creating the equity crowdfunding industry, and the entrepreneurs looking to create and finance new businesses utilizing crowdfunding. Comprised of the largest gathering of industry professionals, this year’s convention is designed to provide participants with an unparalleled informational and networking experience. This is the must-attend event for entrepreneurs and small business owners, investors, crowdfunding professionals and enthusiasts, funding portals, investment bankers, financial advisers, VCs, angels, incubators, business coaches, mentors, secondary stock specialists, equity analysts, journalists as well as tax, legal experts. 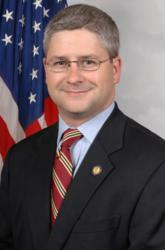 Congressman McHenry is expected to personally accept the award and participate in the 3-day event.